During all the holiday festivities I was at friends home who lives locally and I have known for years, we spend lots of time together and do all kinds of interesting things (that could be a whole separate blog) on this day she had family and a few friends over and the topic of her new closet came up. 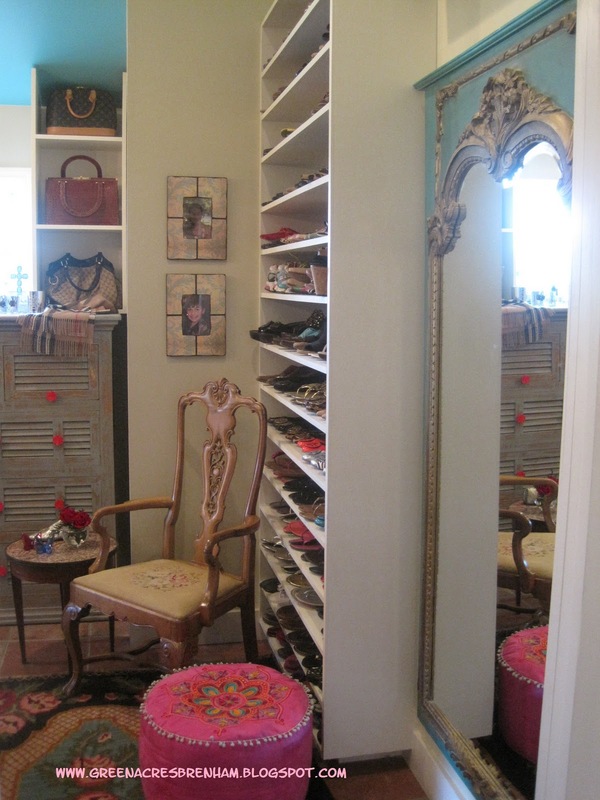 She added on this wonderful, almost fantasy closet (at least a fancy for women) this past year and any new visitor to her home can't wait to run to the closet. Shannon's sister in law is a very popular blogger, Joni Webb from http://www.cotedetexas.blogspot.com/ and she had just asked Shannon if she could take pictures and blog about her closet, so off to closet we ran! 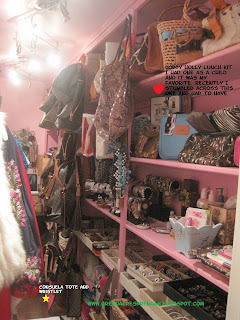 While fluffing up her closet for pictures Shannon mentioned to Joni that while my closet was small it was great and might be fun for readers to see both the large and dreamy closet and the small, compact and practical closet. Joni agreed and my stomach did a flip ( I knew my closet had just been through the holiday season and was NOT ready for photos). 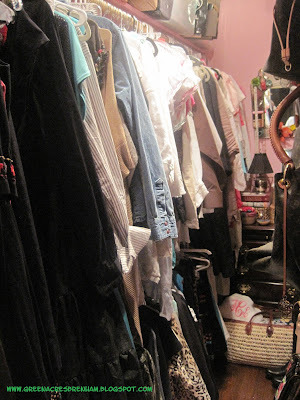 We all fluffed and tinkered around in Shannon's closet and Joni and I both thought it would be fun for our readers to see both closet from two different views, hers and mine. 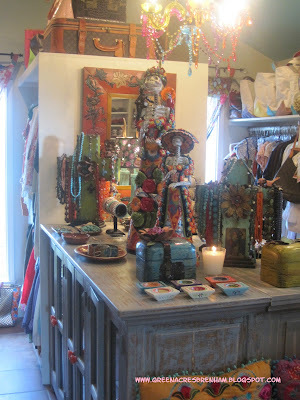 So go to http://www.cotedetexas.blogspot.com/ to see Joni's blog of the two closets. 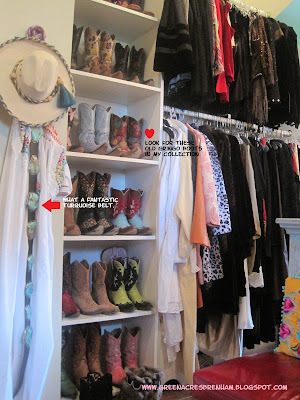 So, since Joni sparked the closet post, I decided that I would try to go about my post giving my readers some tips and pictures to organize their own closets. 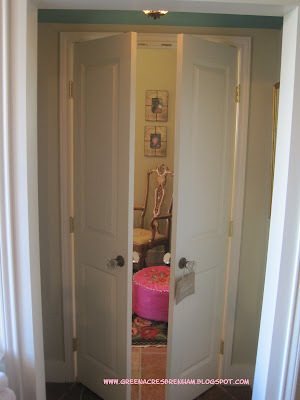 Any closet can look fantastic and size is not the factor to a fabulous closet. 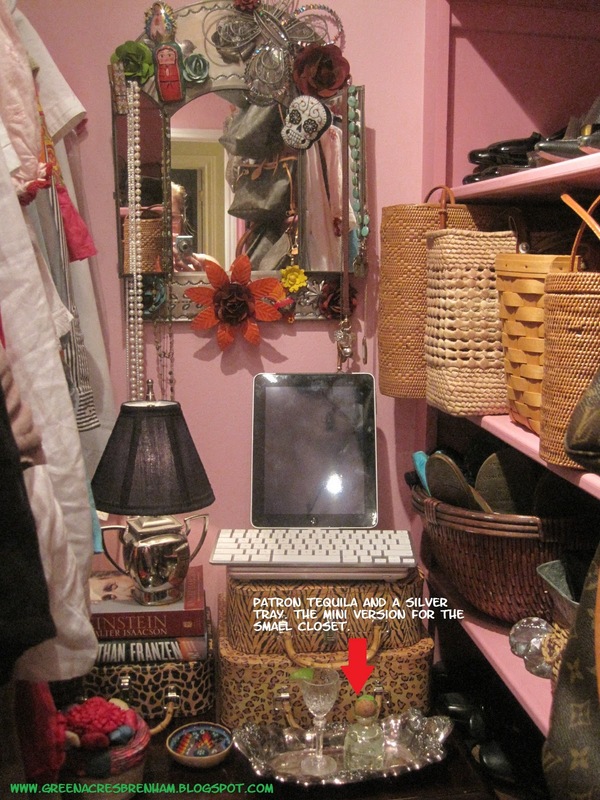 I understand that most women do not have a walk in closet or a room dedicated to all things Tory Burch but every woman can have their space be pretty, organized and functional. Take some time, and purge a little (or a lot), decide what will go back into your closet and make a list of how many and what size baskets or containers you will need, throw in a few personal decorative items, and work on getting it all back into your closet in a organized and pretty fashion (or hire me and I'll do it for you, I literally love organizing, redecorating, overall I love making all things functional and pretty) The biggest thing to consider when you get ready to start your closet make-over(or operation drab to fab) is fitting it to your life and style. 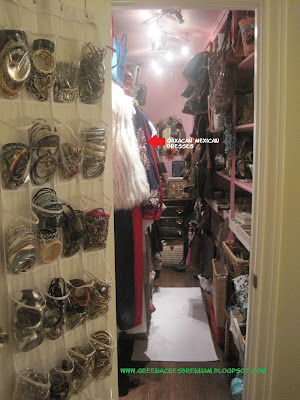 First up: Shannon's Closet (I should have done mine first, her closet is a tough act to follow and mine really is no comparison, only a view of the smaller more compact space). Shannon's closet would be considered by most over the top, a dream, a wonderland. I'm still not sure how she leaves it everyday! I'm convinced if I had my laptop, a mini refrigerator full of diet coke and a pillow I would lock the door and never leave!!!!!! 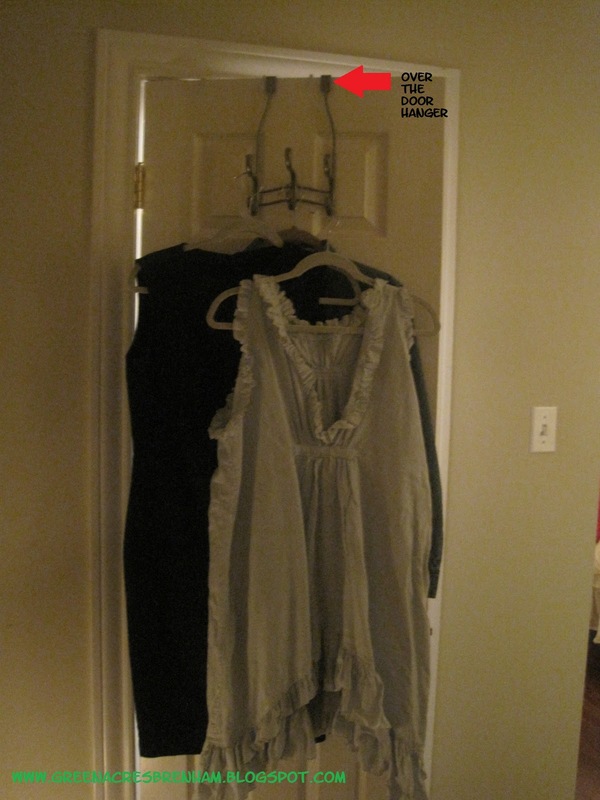 Upon opening the doors this is your first look at Shannon's closet. So inviting!!!!! 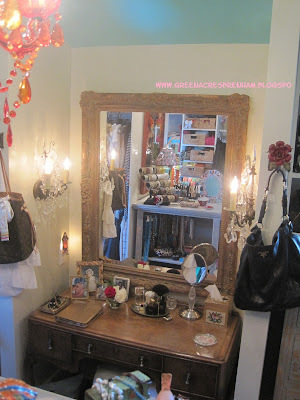 The mirror is a great fine on a Round Top trip from two years ago, but Shannon knew she loved it and because she did, she knew it would work somewhere in her home (at the time she did not have this closet) . I have to say that in the past two years that mirror has been all over Shannon's house looking for it's forever space and when the closet addition was started, right away she knew exactly where it would be hung for the last time. The lesson, buy what you LOVE and either work around it or build around it. If you are standing with the mirror (from the above picture) at your back this is your view (part of it anyway). Shannon's closet is about 18 feet by 13 feet with 13ish foot ceiling (I know sounds like it should be 12 foot ceilings, but I asked Shannon to double check) and full of color, with a chandelier that is as colorful as the closet itself, and in the center is this wonderful peninsula with jewelry storage on one side and cabinets for additional storage on the other. 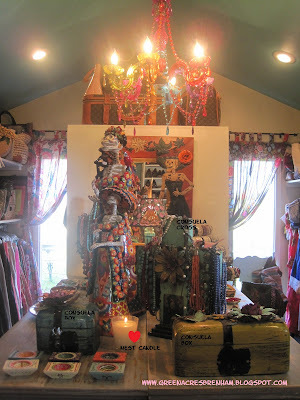 If you look close at the picture you will see the Consuela boxes and crosses and even a Consuela magnet on the hat of the Catrina skeleton mirror all of Shannon's Consuela products were purchased at a local shop, Antique Gypsy (on Alamo Street in the middle of downtown Brenham) the owner Mary Ellen is precious and we LOVE her. If you stop by tell her Tikaa said,"Hi." Behind the Catrina mirror is hanging storage for dresses and blouses, and of course on top of the hanging storage is even more room to store luggage. NOT an inch of this space is wasted. In front of the island is this great bench. I've seen it used for holding Shannon's luggage when packing for a trip, or friends gathering around during a party. Yes, we have been known to hang out in the closet and have a few drinks. 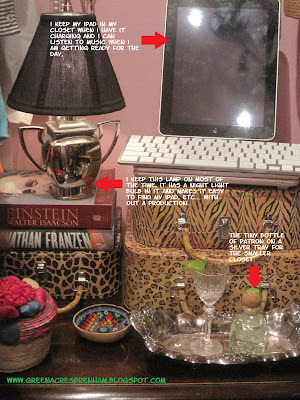 No, Shannon does not have a full time tequila bar in her closet but when fluffing the closet we thought "why not." When you get to my closet look for the mini version of the tequila bar. On the right side of the island is jewelry storage (as well as the top). The pink and cream colored containers are from Target. You can find them with the hangers, irons, etc... You will see the same ones in my closet as well as the black velvet bracelet stands. The jewelry containers are great, they come in an assortment of options, with lots of sections, only a few sections, spots for rings, earrings, necklaces, and on and on. The best part is they stack on top of each other perfectly. The other side of the island is for sweater storage, scarfs, or anything that you might want to fold and find quickly. The cabinet doors have glass fronts, which helps when searching for sweaters or scarfs. This is a view from the back of Shannon's closet. It's a much better view of the beautiful mirror and all the great shoe storage and of course the television. 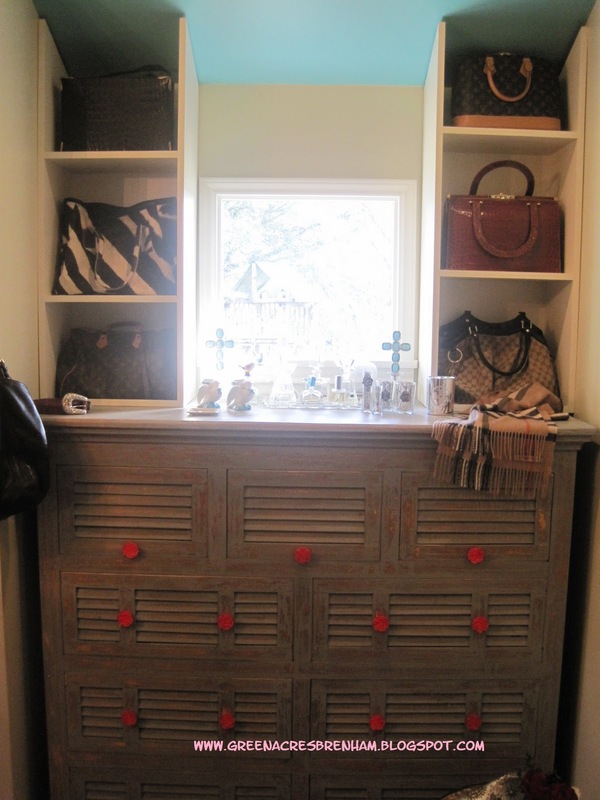 Another fun tip, to make a piece of furniture a little more fun and interesting add some great drawer pulls. Anthropology and even Hobby Lobby have some GREAT drawer pulls and changing out a standard drawer pull for a more interesting and fun one is something anyone with a screwdriver can do. I love the shelves, which will be obvious in my closet. The baskets (which are made out of banana leaf) are again from Target and located close to the hampers and plastic organizing bins. Perfect way to store make up bags, evening bags, straw handbags, travel necessities, etc... I use the same baskets in my pantry, Target carries a variety of sizes and they range in price from ten to twenty dollars. A closer look at all things Tory. 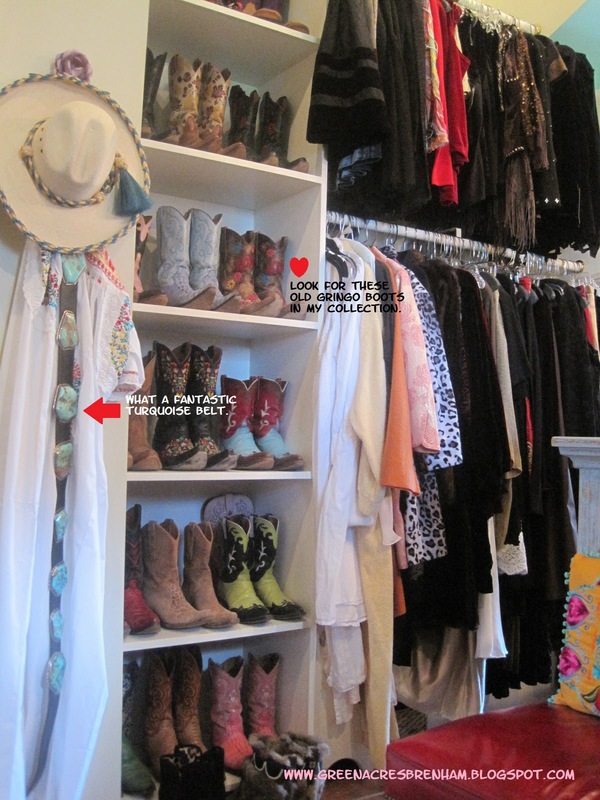 We are still on the same side of the closet, Shannon loves, loves, loves her cowboy boots and she has an incredible collection. The boot storage is about three feet wide and thirteen feet tall. 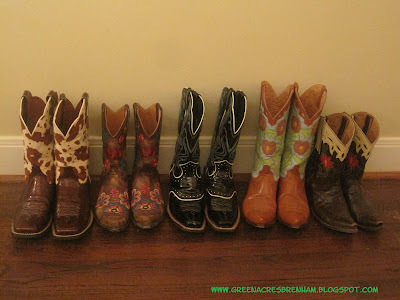 Three pairs of cowboy boots per shelf, thirteen feet high, that's a LOT of cowboy boots. I am a lucky friend, we wear the same size shoe!!! Now the other side of the closet, Shannon's dressing table is located to the right of the island on the same side as all the jewelry. 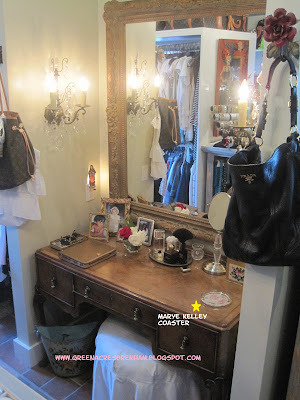 Before her closet was added on this year the dressing table was located in her bedroom. 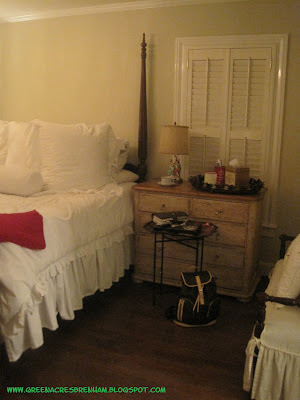 It has been in her family forever as well as the mirror and sconces. Her family has to be the BEST at saving all the right things for later use. Shannon recently informed me that her dressing table was the first piece of furniture she bought at auction from Hart Gallery in 1978 while still in High School. Another perfect example of "buy what you love." 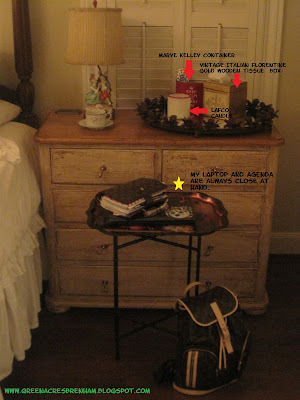 I bet Michelle Fritz made the slipcover for her stool, Michelle's information can be found below in my closet. 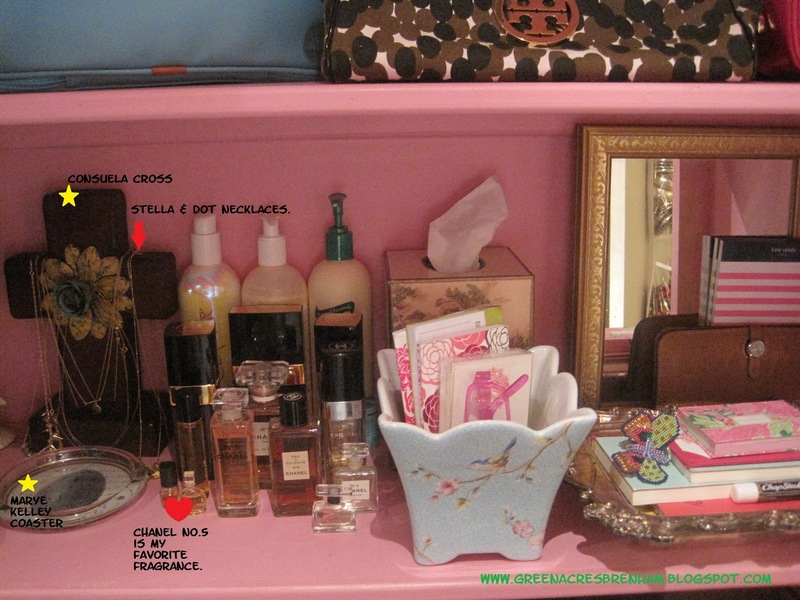 Another look at her dressing table. who wouldn't want to put their make up on and fix their hair in that spot each morning. I took this picture 500 times, but I can't competed with the sun and didn't have time to come back at a different time of day. Anyway, the piece of furniture was bought to use in the closet and then the closet was built to accommodate it, so again it is said, "buy what you love." 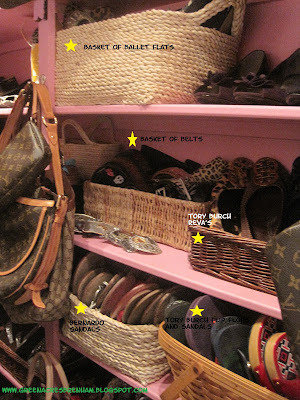 The brown crocodile handbag (second shelf on right) has been in Shannon's family since the 40's and the zebra tote was at one time Joni's from http://www.cotedetexas.blogspot.com/ Shannon and Joni are sister in laws. Speaking of Joni, I believe the Burberry scarf was a birthday gift from Joni (Shannon recently celebrated her 50th birthday). If you look close at the leather belt (far left), that was a gift from a collection of friends for Shannon's 40th birthday, custom made by Clint Orms. If you know me then you know I always say when it comes to jewelry, if one is good then ten is better. Well with Shannon if one is good then every color and style is better. The question we both then ask, "Does this ring come in a bigger style" we don't mean size, we adore large rings. Yes, to those reading this and not from Texas we do all wear boots, big jewelry and cowboy hats. 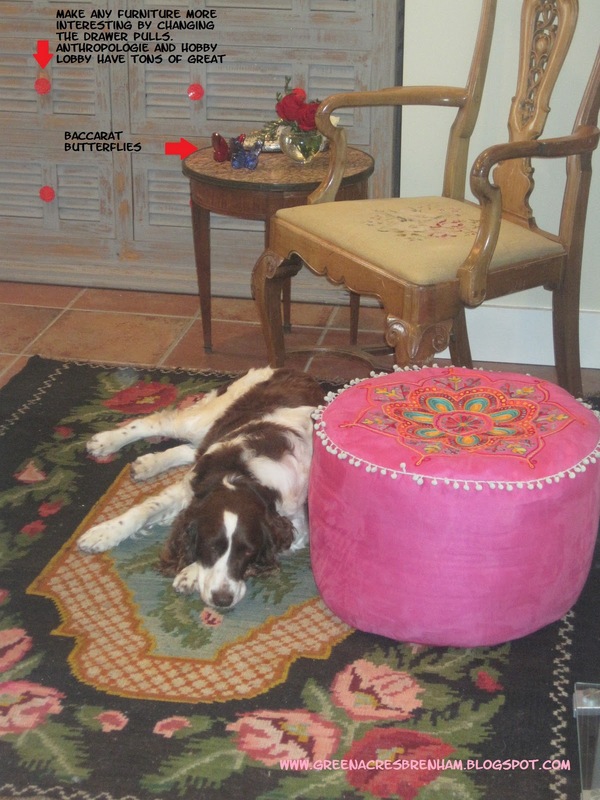 At one point during all the pictures one of the five English Springer Spaniel's came in to take a nap. Kila is the oldest of the pack and in my opinion the sweetest. Next up, my room and closet. My room is not fancy and rather low key, especially for me but if you have seen the rest of my house then you would agree this is low key. 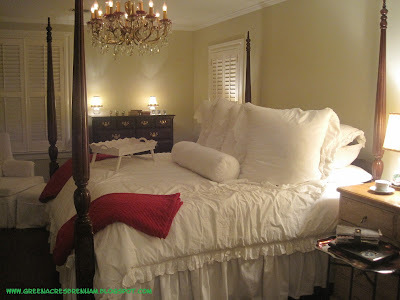 The rest of my home is busy and I love it but once I am ready to head to my master suite I like very little fuss and kind of an untouched and simple style. 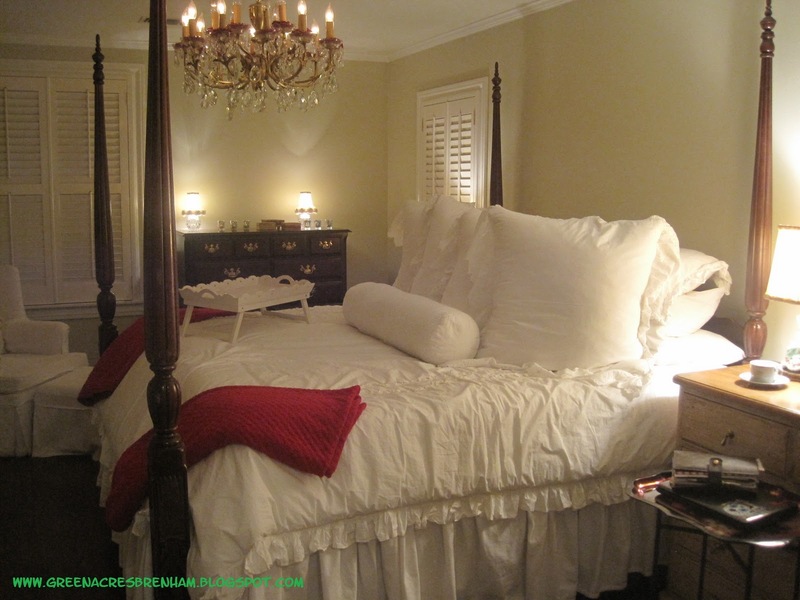 make slipcovers in white linen. You can find Michelle at http://www.michellefritz.blogspot.com/ she lives locally, her blog is not current but you can get her contact information. Again when I say simple, I mean it! No curtains, no art on the walls, just paint (rice grain is the color) and a few pieces of furniture. The bench is slip covered in linen also done by Michelle Fritz. A few things are a must next to my bed, my Louis Vuitton agenda (a Christmas gift from the Judge two years ago) , laptop( I blog in bed, late at night) and iPhone ( I use the alarm on it). The lamp has a matching partner on the judges side of the bed (which is the only thing on his side of the bed). I must admit blogging in bed is my favorite place to blog. The rose and metal tray is Jan Barboglio, and the Louis Vuitton backpack was a Christmas/Birthday gift this year from my parents. I bet I have had that tole tray (using as a table at moment) for at least fifteen years. I love the lamps, but I'm not in love with their location at the moment, I had a pair of clear, solid crystal urn shaped lamps from Ballard Designs next to the bed but I found their forever location in our home early this year.These lamps are lovely and I adore them, but the room is large and with little to nothing interesting going on. A pair of statement lamps are exactly what I need. There are two navy blue lamps that are BEAUTIFUL at Leftovers Antiques (3900 Highway 290West, Brenham,Texas). Make Leftovers Antiques a MUST stop if you are coming through Brenham, I swear they are better than Blue Bell Ice Cream (Blue Bell is fantastic). Stop by Blue Bell get everyone a scoop of ice cream and eat it on your drive over to Leftovers. The view from across my bed, again simple, simple, simple. I love the silicone light bulbs on my sconces (you can get them at Kuhl Linscomb for about $3each, located at 2424 West Alabama, Houston,Texas). 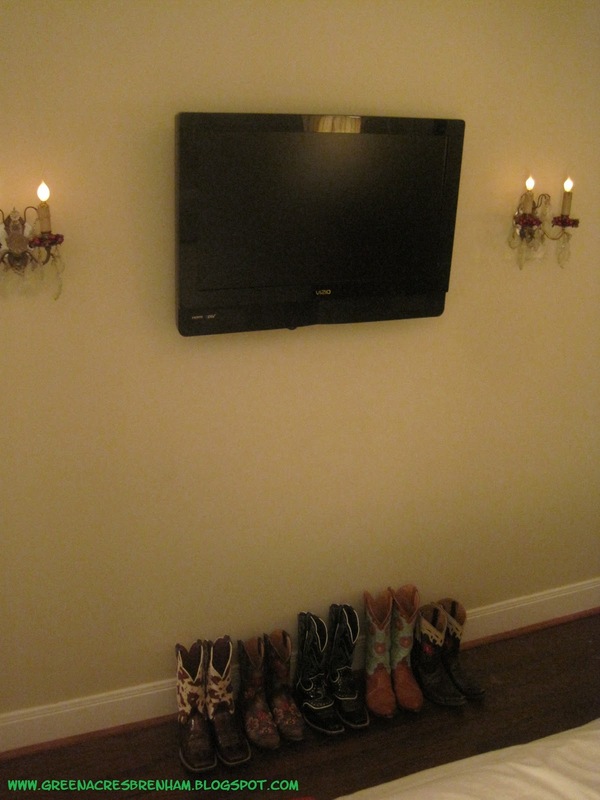 I am packed to the max in my closet so I keep my cowboy boots right under the television. They really are to pretty and interesting to hide. 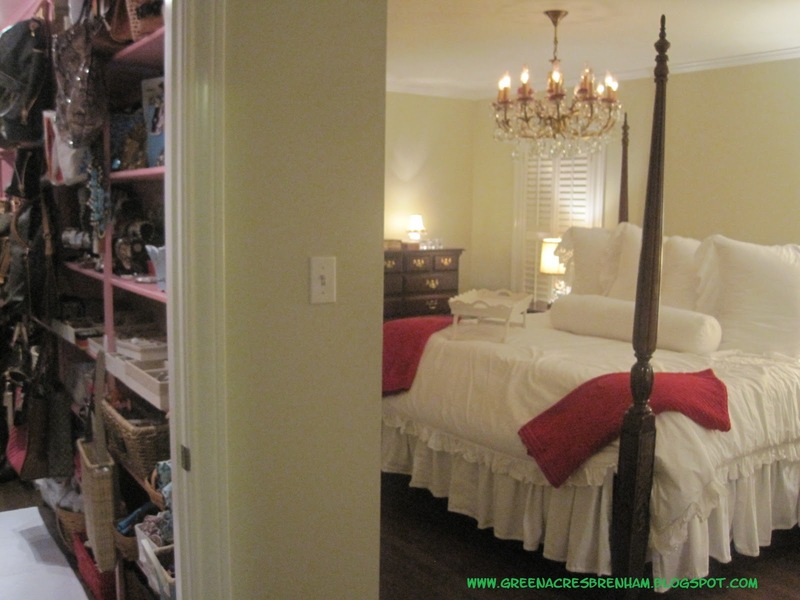 Notice the sconces and the berry accents. The view upon entering my master suite. Normally I would have the door closed to my closet but since this is eventually leading to seeing the inside of my closet I thought leaving it open for the picture was the best idea. Eventually I would love to have a sea grass rug under my bed. organized. But it is about 13 feet long and 6 feet wide. Trust me NO hanging out or parties are being held in my closet, I'm pretty sure the Fire Marshall would declare a maxim capacity of 1 and our Airedale Terrier, Harriet would not have enough room to lay down and nap. The fox fur vest hanging toward the front of the closet was once a coat (from the late 70's), and for the record I did not purchase the coat ( I did have a rabbit fur coat in the late 70's and I thought I was awesome when I wore it, I was 8 years old) but I kind of came into ownship of the coat by accident and decided that it would look great as a vest, so I took it and had it repurposed into a vest for the whopping expense of ten dollars. It looks great with a black turtleneck and silver jewelry. My kids are totally grossed out by it (because it use to be an animal) but it reminds me of my 8 year old self in my awesome rabbit coat. I LOVE bracelets and had to get creative on how to store all the bracelets I have. 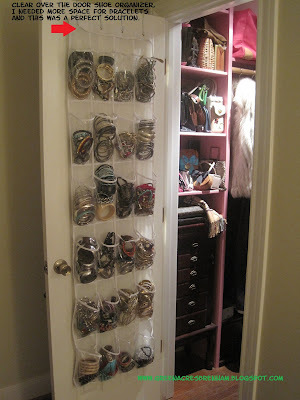 So I decided to try this, a clear over the door shoe organizer and it works perfectly. In this picture you can see the jewelry trays (again from Target) and black velvet bracelet stands, which I also use for watches. Yes, I was addicted to white watches. Hanging is my collection of Louise Vuitton hangbags that I have been collecting forever, my first was when I was a junior in High School a Speedy (and I still have it, actually my daughter has it). 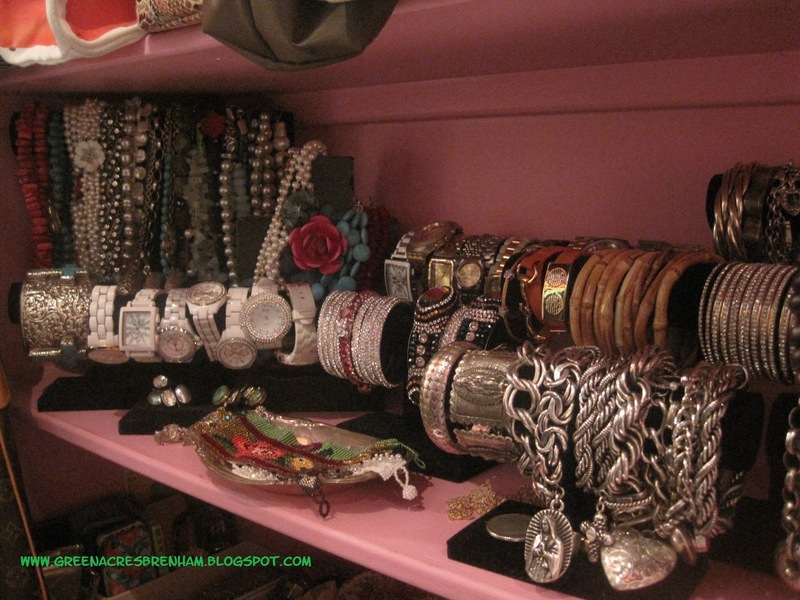 On my shelves are my absolutely favorite bracelets. 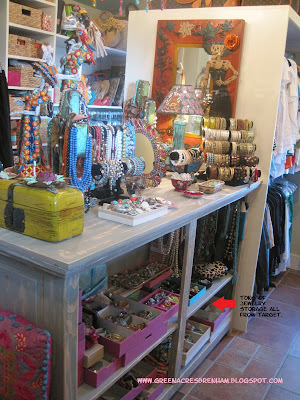 A wider look, tons of shelves (from floor to ceiling), organizing trays and baskets. Notice the Holly Hobby metal lunch kit on the shelf ( it has a heart next to it). I had this exact one as a little girl, and again I thought it was AWWWWWWWWWWWWWWESOME, I came across this one and thought for twenty bucks I could use it for storage in my closet and be reminded of a great memory. I'm pretty sure that lunch kit and my second grade teacher Mrs. Sonz at Wainwright Elementary go hand in hand. She was teacher I'll never forget. 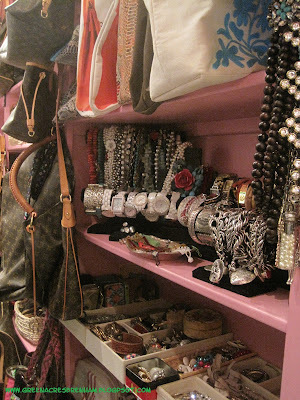 At eye level when you first enter my closet I keep my lotion, perfume and delicate necklaces. I also keep paper and pen handy, it works great when packing, I can jot things down so they don't get left behind. 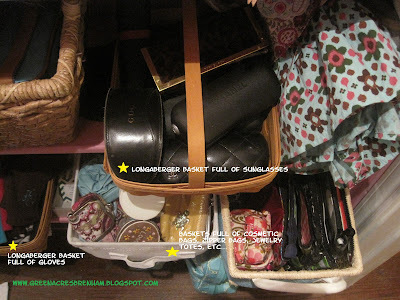 Baskets are great for organizing almost anything. In this picture you can see I used baskets to organize my sunglasses, cosmetic bags, jewelry bags, travel accessories, gloves, and john hart. 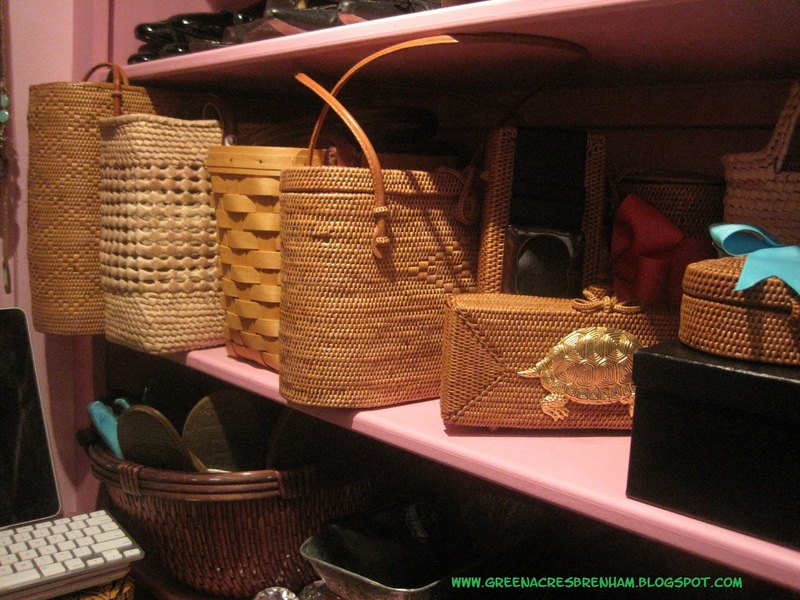 Again baskets are used on this end of the closet to organize shoes. The other side of my closet is for clothes, two bars for shorter things and a section for longer items. I'm tall so when I did this closet I had my top bar hung higher than average for maxium usage of space. What you can not see is below my section of dresses I have larger baskets for hangbags I use less often and my luggage. That was an advantage to hanging the bar higher for my clothes, I could use the space under the dresses and maxize every inch of useable space. This is the back wall of my closet, a small chest, my ipad charging, and a fun mirror found in San Antoino with consuela magnets added for interest. The lamp is an old sugar bowl and uses a night light bulb, it stays on almost always. A closer look. 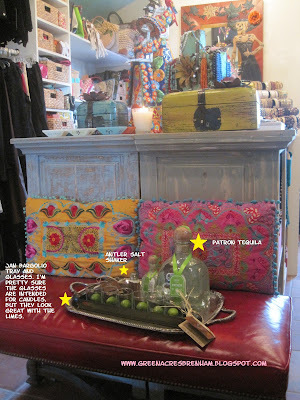 See the mini tequila bar. I had to add this after Shannon put the tequila bar in her closet. 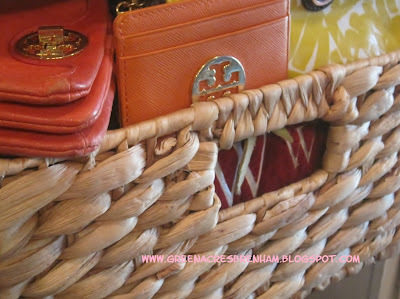 I love straw handbags, and have a little collection stored on the back shelf of my closet in the fall and they get moved forward for part of the spring and the entire summer. In my straw handbag collection you will find Bossom Buddie straw bags, Longaberger wooden woven bag (with the exact bag only smaller inside) and a few misc. woven bags. I pull out this over the door hanger when I am packing for a trip to organize outfits or when getting ready for a fun, special event. This one was about eight dollars at Walmart and has six hooks on it. One last little organizing item to share. I got both of these for Christmas (great gift), they are perfect for organizing all my makeup, moisturizers, lip gloss, basically all things girlie. My house is older and my bathroom is small, so this was a great fix for me. 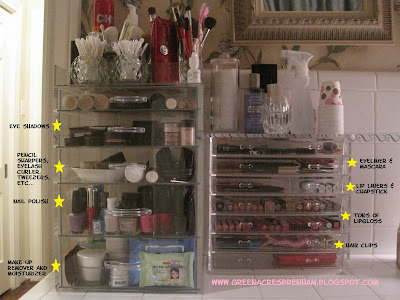 Not exactly sure where to find them but I'm sure you can google arylic make up organizer and a ton will probably appear. I hope you were able to get a few ideas for your own closet. Again I am available for hire, contact me throught my email. 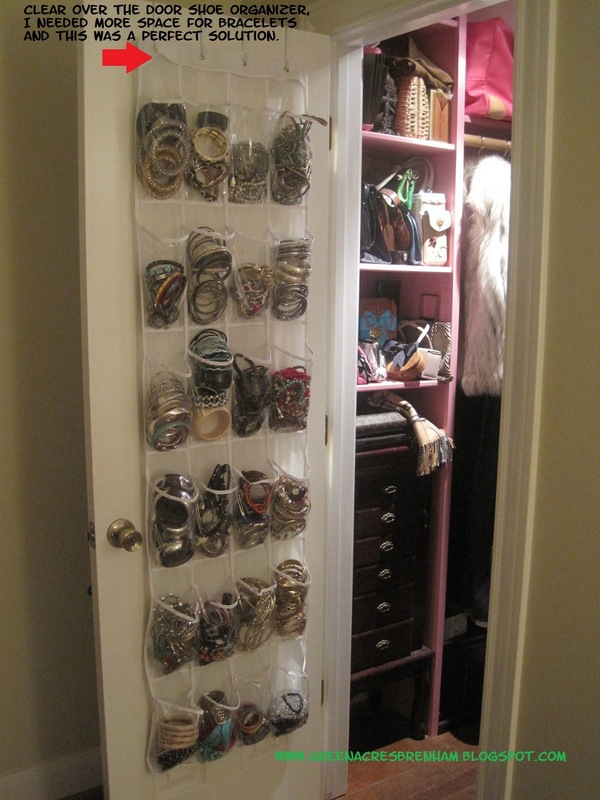 Start the new year off organized and fabulous. I can't wait to read your comments, it's easy to do, click on comments and box will appear for your to leave your thoughts. Don't worry if you don't see them on my blog immediately, they take a bit to appear. AWESOME post!! I love Shannon's closet and yours, too. Can't wait to see what you do next. This was so fun! I love to look but this a bit over the top for me. My daughter on the other hand....lives this. So fun! Can't wait to come back. so glad you shared! cant wait to see what lamps you choose.. I want both those closets...will you help me create "my look"? Such a fun post Tikaa- your closet is amazing and I love your new makeup organizer! Leftovers is great, I've stopped there a few times on my way to/from Round Top. Thanks for stopping by and visiting me and Happy 2012 to you! 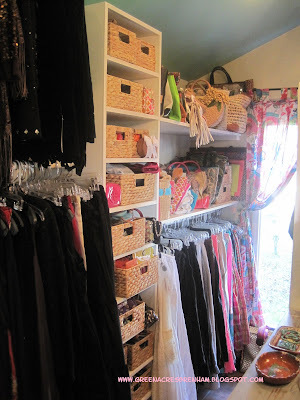 Thanks for sharing your fabulous closet storage ideas -- I'm going to bookmark this post and come back to it when I'm mentally and spiritually prepared to tackle my own closet. And thanks for visiting my blog; I hope your daughter enjoys whichever eReader she chooses! 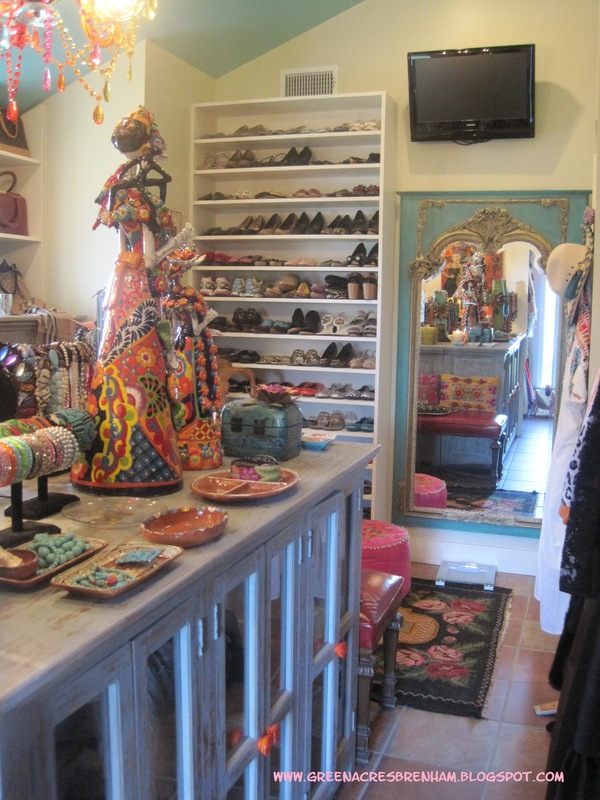 Beautiful closets! And what a GREAT Bosom Buddy turtle bag....a good friend must have given you that! Now...walk on over to my house and help me redo my closet! Thanks for your sweet comments on Vintage Mulberry! I am so glad to have found your blog as well! Once again, I still can't get over the closets!!! Maybe one day I will show you a picture of my closet disaster! Anyway, I loved your post as well as Cote de Texas. Look forward to reading many more of them! Fun stuff! Thanks for sharing and I love your pretty bed! is just the most creative person I know! Can't imagine the ability to make a closet with so much stuff, look so good! Thanks for sharing! Thanks for sharing -- I took notes on all of the great places in Brenham that you mentioned -- I will plan a day trip based on your suggestions. Happy New Year! Thank you for stopping by and leaving such a touching comment :) Wanted to say: That chandy you have in your bedroom is to die for! Absolutely beautiful. This was so fun to see the "behind the scenes" of Joni's post. I'm actually a Texan living in New York so I am really loving both of your collection of cowboy boots! 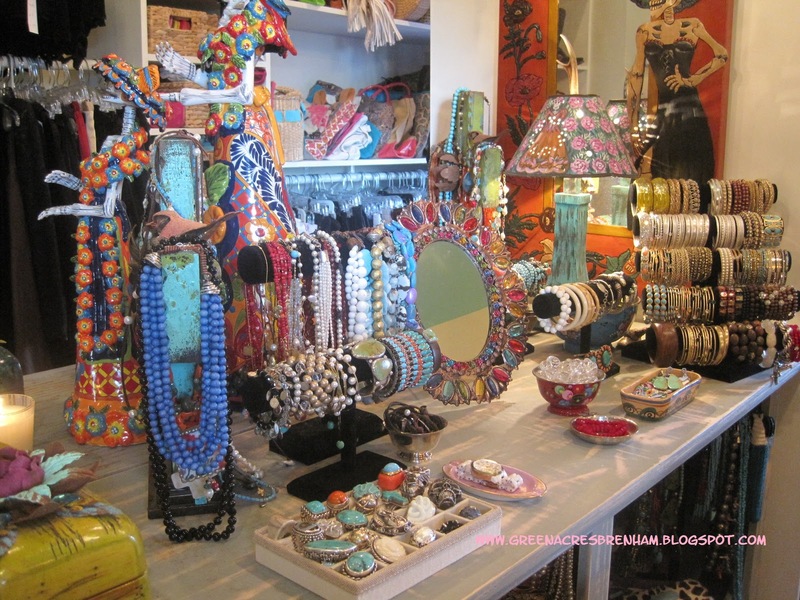 And, you're inspiring me to do a little "closet clean out" and get my jewelry organized! Love seeing what you have. Mine's all tucked into a drawer. You have really inspired me to work on my closet. We spend time in there everyday...why neglect it? Thanks SO much for sharing it. Really lovely. loved this! so glad we got together this Christmas - this was so much fun!!! hehe. next year - yours and Shannon's offices!!! I'm giving you a year's notice. ahahaha. Joni, it was fun. I'm up for the work room/office post. Can't wait. The comments should be interesting.